US Army Cpl. 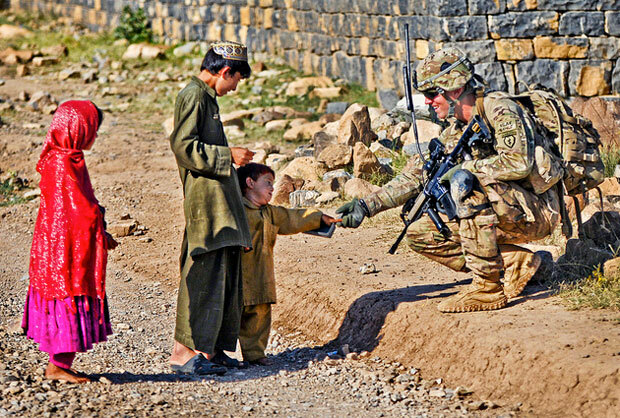 Brian Lewis, a native of Duluth, Minn., and team leader assigned to 501st Infantry Regiment, 4th Brigade Combat Team (Airborne), 25th Infantry Division greats an Afghan boy while conducting a security patrol in Shaway Valley on June 2. Blackfoot Company, stationed at Combat Outpost Chergataw, routinely patrols the valley in efforts to bring stability to the region. US Army photo by Staff Sgt. Jason Epperson.